Bridging Sydney , Sydney, 2006, 165 (colour illus.). Denise Mimmocchi, Sydney moderns: art for a new world , 'Icon of modernity: the Sydney Harbour Bridge', pg. 154-163, Sydney, 2013, 160 (colour illus. ), 316, 324. 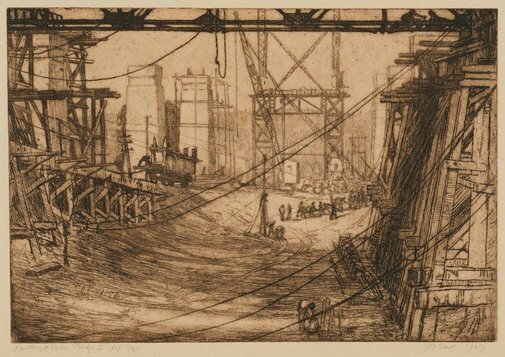 Macushla Robinson, Stars in the river: the prints of Jessie Traill , 'Building the Harbour Bridge series', pg. 52-61, Canberra, 2013, 9, 56 (illus. ), 57, 107, 112 (illus. ), 146, 171 (illus.). NOTE: The text on page 107 speaks generally about Traill's Sydney Harbour Bridge works. 'Building the Harbour Bridge' series is specifically discussed on pages 56-60.